This must be a week for lovely covers. 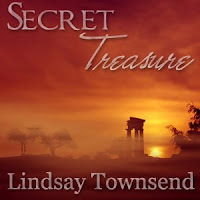 Here's the one AudioLark have given to the audio version of A Secret Treasure - really warm and atmospheric! Further details are here at AudioLark. That is a gorgeous cover. I am VERY interested in Audio Lark. Couldn't get the link to open for me, though. I will keep trying. WOw, well, as soon as I can haul my chin back up of the desk I will tell you how beautiful that is! What a GORGEOUS cover! One of the best I've ever seen on anything, I think. Fabulous, Lindsay! Hi Cheryl, sorry I forgot to add the http bit before the www bit. The link to Audio Lark works from my blog. Delighted you like my cover! I'm bowled over, too! Thanks, Jane! I am utterly thrilled by it. Such a wonderful surprise! Lindsay-- this is absolutely beautiful! You do have the luck with covers! Oh that is a beautiful cover. It so mystical and fits the title so well..
Congrats on a beautiful cover. That is a *fantastic* cover, Lindsay, and such a fast response! I hope it goes well for you. Have AudioLark explained how all this is going to happen - like who reads it?? Lindsay, a stunning cover! I'm impressed. Did Celia Kyle design it? Thank you, Zequeatta, kaye, Kathleen, Margaret, LK, Linda., Savanna! I am very lucky, I agree! I think this is a cover based on Rhodes itself - I remember such ruins and scene from my time there. Re Audio Lark - this is all a big adventure. I have no idea who will read, or anything, but I'm excited to find out. So far I've been impressed! Lindsay, the cover looks great. I'm very excited for you about this project. I am addicted to audio books. How else would I be able to read so many great books. Thanks, Amber! I'm looking forward to seeing what happens next. Hi Celia - I would check your contract first and your original publisher to ensure you have your audio rights and then, why not?